I was invited to take a unique photography course. Depending on where you sit when you read this, you may react to that opportunity in a number of ways; from horrified to delighted to why is this even an issue? While Israel is a very mixed society with Arabs and Jews – and a healthy sprinkling of others – sharing parks, stores and universities, and in some places sharing neighborhoods, I live across that most irritating of invisible lines marking the area known as Judea, the “West Bank” or the “territories” depending on your perspective. Society mixing is somewhat more tenuous here. 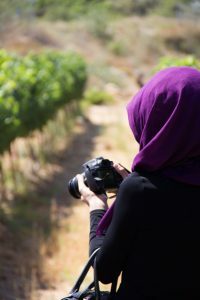 My own reaction to the opportunity was, “Cool!” After all, I love photography, I love learning new skills, I love things that are free, and frankly I was intrigued by the idea of having an opportunity to interact – really interact – with local Arabs. Others in my community were more skeptical, or even downright opposed. Whether they were scared (“What if someone pulls a knife on you?”) or against it for ideological reasons, there were those who voiced their objections. And to be frank, their objections for the most part weren’t irrational or unreasonable. Then again, no one has ever accused me of being overly rational or reasonable… I signed up for the course. I arrived the first day with absolutely no idea what to expect. With a mix of apprehension and excitement I entered the rustic compound tucked away near Gush Etzion Junction, wondering how I’d never even noticed its existence before. I wondered: Would the Arabs be friendly? Would there be a major cultural barrier? Would it be insurmountable? What about language? Would they speak English, or even Hebrew proficiently enough for us to communicate? 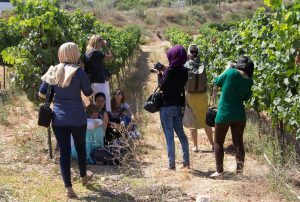 I was left wondering because, aside from the teacher, only Israeli women had shown up. We each made ourselves name labels written in English and Hebrew, with room for the Arabic that the Arab classmates we’d hoped would eventually join would add for us. With this note of disappointment, the class began. The teacher showed us the basics with loaner cameras that she’d personally raised the money to purchase. 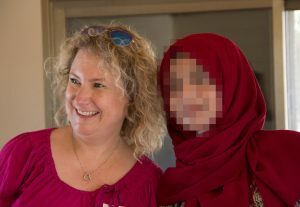 As there were only Israelis at the moment, she had us pair up, wander around the compound, and take each other’s portraits. A great exercise, but sort of missing the “coexistence” point of the class. Finally, on the second day, the Arab women arrived. The day went surprisingly well. While there was little communication, mostly due to the language barrier, it was tremendous fun to photograph each other. 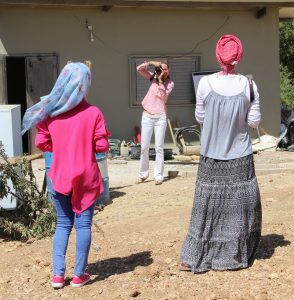 Some of the Palestinian women were traditionally dressed, including head scarves, and others were in Western-style clothing, not especially distinguishable from secular Israelis. There were plenty of smiles, and we were all relaxed. For my part, I was accumulating beautiful photos that would ordinarily be hard to capture, except perhaps on the street, where I am actually quite shy to photograph strangers. This opportunity was ideal! As I photographed, I envisioned the article I would write about the possibilities of coexistence and cooperation and all that… Perhaps it would be a photo essay! Maybe it would even be translated into Arabic! I was quite excited about it. Unfortunately, the Arab women did not show up on the third day. 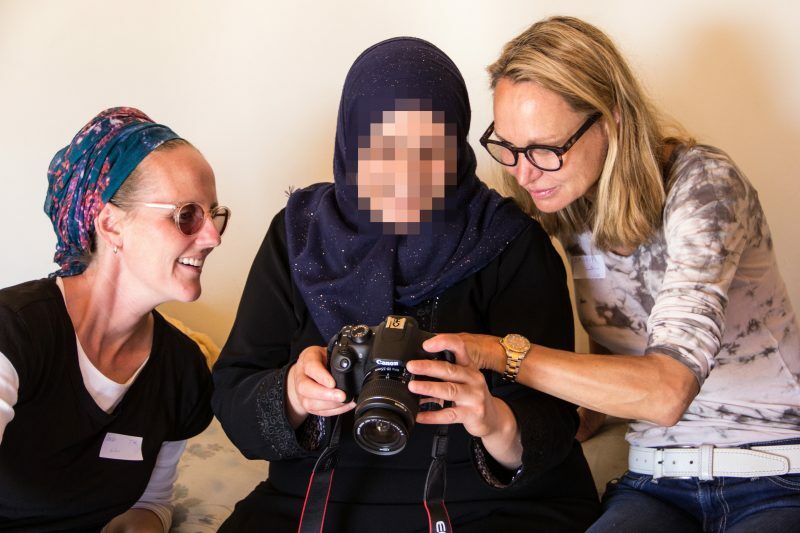 It was disappointing to discover that one of them was actually paid to ensure the attendance of the other Arab women, and that they were not nearly as forthcoming in participating as the Israelis had been. The last day, however, they were there, and on time. We took a little field trip to a vineyard for variety and continued to photograph each other. It was a lot of fun, and I got some more great shots. I was starting to get really excited about my upcoming article. I figured I wouldn’t have to write much at all, as the photos would say all that was needed. I mentioned this to one of the Arab women who looked at me like I was insane. What she said next devastated me: I had no permission to publish any of my photos of those women at all. I was dumbfounded. Why take all of these photos if I was going to do nothing but bury them in a folder on my computer? What were we expected to do with these photos if not use them in the way I had planned? Then I thought beyond my personal disappointment: What in the world was the point of the class if we could not share the experience with our people? All of our people. My people would, at most, look at me with disdain. But many would see the possibilities. And it might make people think… What about the Arab women? Couldn’t they see this? Why would they want to waste such an amazing opportunity? I pushed the issue and what I discovered was most tragic of all: they were genuinely afraid – some even for their very lives – should anyone in their communities find out. It was ironic: the Jews were afraid to attend the course for fear of getting hurt there; the Arabs were afraid to attend the course for fear of getting hurt at home. I can vouch for the feeling of safety and comfort felt during the class. 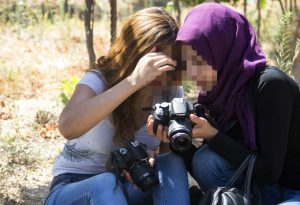 Unfortunately, no one can vouch for the safety of the Arab women who participated going public in their communities; after all, none of them were willing to chance it. Maybe it’s just the beginning. Maybe it has to start slowly. In fact, I’m sure it does. There are possibilities. We do live side by side, shop in the same stores, and occasionally take (secret) photography classes together. I know other efforts exist as well. We are too well aware of the domino effect of terrorism. None of us are going anywhere; somehow we have to live with each other. We need to start somewhere. Perhaps just a few people, on both sides, can start small. The key is that they can’t just coexist; they need the courage to tell the world. First published in The Jerusalem Post’s In Jerusalem, November 18, 2016.